Canopy is an Australia/Singapore co-production shot on location in the beautiful Singaporean jungle which announces debutant director Aaron Wilson as a potentially interesting new voice in the Australian cinema. It’s 1942 and Singapore is under attack from the Japanese. An Australian fighter pilot, Jim, crashes into the jungle and finds himself alone and unarmed in enemy territory. He crosses paths with a Singapore-Chinese soldier, Seng, in a similar predicament and the two join forces in the hope of getting out alive. A far cry from the adventures, epics or men-on-a-mission stories we usually get from the war genre, Canopy endeavours to tell a smaller more human story in these most trying of circumstances. In their fight for survival, Jim and Seng experience a basic human connection despite the fact two men don’t speak each other’s language so communication is limited. 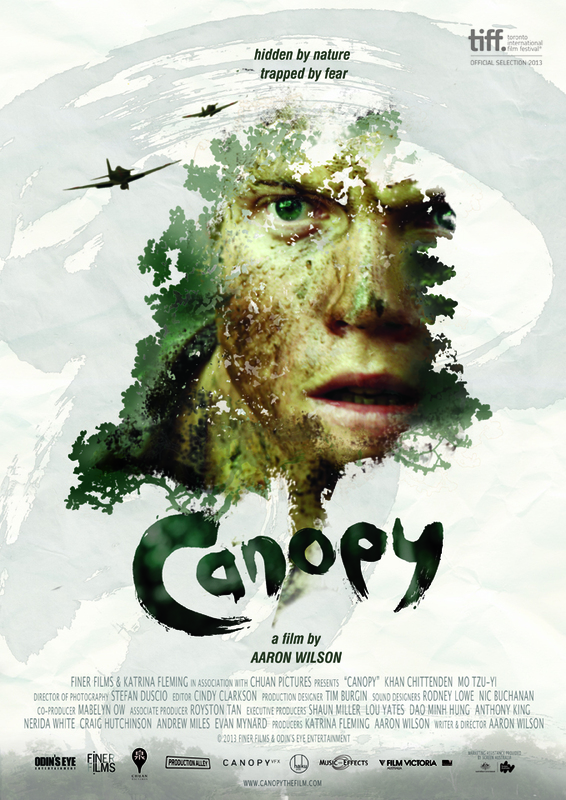 While Canopy is the first feature from young Australian director Aaron Wilson ,he has previously made a number of short films and it shows. Canopy has a bit of a short film feel to it (it has a runtime of only 84 minutes). It is a very simple story told in a minimalist fashion. A smaller budget war film is naturally going to be restricted in what it can show on screen, so must come up with other devices. In the case of Canopy the sound design is very important to the film’s effectiveness. Wilson’s use of sound creates an immersive cinematic experience as we are placed in Jim’s subjectivity. We only see the things he sees, but we also hear the things he hears; birdsongs, the rustling of bushes, the pops of gunfire, the overhead hum of fighter planes, the far off sounds of explosions. The terror and uncertainty of his experience in the jungle comes from the fact that he can hear things that he can’t see, and the film allows us to share that experience. This subjectivity extends to the relationship between the two characters. As mentioned, there is very little dialogue in the film as the two characters don’t share a language. While Seng talks significantly more than Jim, we are not given subtitles for his dialogue so we don’t come to know him any better than Jim does. The film’s conclusion is a bit disappointing, not as a result of providing an unsatisfactory resolution to the narrative but rather due to its lack of clarity. It was not until scrolling through the names in the final credits that I was actually able to decipher what the ending was seeking to represent. While Canopy is unlikely to make an impact at the box office – its business will be done on the festival circuit – the recent success of Gravity and, to a lesser extent All is Lost, has seen the subgenre of the single character survival drama achieve some prominence recently, and while Canopy is a significantly more modest film that either of those, it is none the less an interesting addition to the subgenre.